Posted on 9, September 2016 by EuropaWire PR Editors | This entry was posted in Banks, Financial, Investment, Ireland, Management, Technology and tagged data lab, data lab in Dublin, Deutsche Bank, Kim Hammonds, Technology and Operations, The Hive. Bookmark the permalink. LONDON, 09-Sep-2016 — /EuropaWire/ — Deutsche Bank today opened a data lab in Dublin that will create 40 new jobs. It also announced plans to create a further 125 Technology and Operations roles in Dublin supporting its Global Markets and Corporate & Investment Banking divisions. 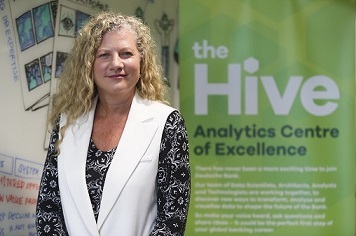 The data lab, known as The Hive, will be a global centre of excellence for the Bank employing data science, visualisation, analytics and technology specialists. These staff will apply advanced data tools and techniques to support a range of initiatives across the Bank. As part of Strategy 2020, Deutsche Bank is modernising and simplifying its technology by insourcing critical technology capabilities, automating processes and using data to tailor its products and services to clients’ evolving needs. Dublin is an established financial services centre for data analytics and technology and The Hive will complement the Bank’s existing infrastructure activities in the city.